Wire braces aren’t so traditional anymore with WildSmiles. Customize your braces and make them about you! Show off your personality with WildSmiles, now available at FUNtastic Dental & Orthodontics. So your child or teen is not so happy about getting braces? We offer an alternative to standard braces that make wearing orthodontic appliances fun – WildSmiles Braces™! Braces for kids that rock! 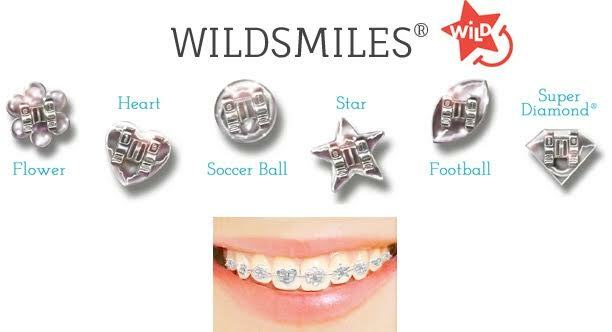 WildSmiles are specially designed brackets that come in a variety of fun shapes including Stars, Hearts, Soccer Balls, Footballs, Flowers and Super-Diamonds®. Patients get to choose the shapes and colors they want, making their braces as cool and unique as they are! WildSmiles make orthodontics a fun experience! WildSmiles works exactly the same as traditional braces, are high quality, made in the USA, extremely strong and aesthetically pleasing to give you a custom designed smile. WildSmiles brackets are bonded to four of the upper front teeth and Dr. Bhavnani threads the wire through the brackets to create the proper alignment for your smile. The difference is they come in six different shapes that can be mixed and matched to showcase your personality. WildSmiles are safe and provide the same level of quality and effectiveness as conventional braces. Manufactured in the United States with surgical stainless steel, they are created to the highest standards for excellence in function, safety and aesthetics. Your child will receive the same excellent treatment outcome with WildSmiles Braces as he/she will with conventional appliances. WildSmiles are comfortable and safe for all ages. To schedule your free complimentary consultation, call us today and request your WildSmiles braces!